An arbitration judge this past June restored $10 million in withheld pay to Philadelphia Energy Solutions employees. 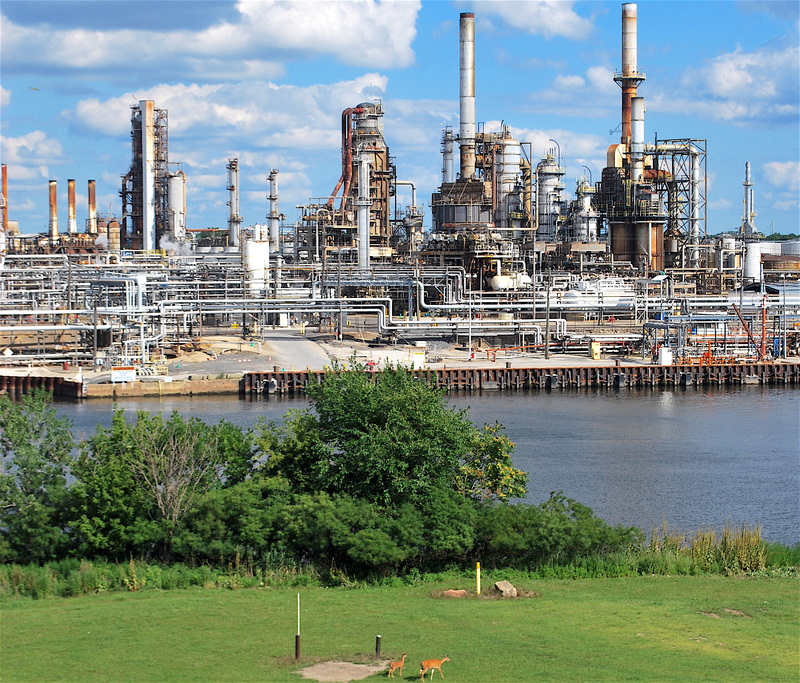 Workers claimed the southwest Philly refinery’s board broke a collective bargaining agreement when they unilaterally cut retirement and healthcare funds. The Energy Solutions refinery is the single largest contributor to air pollution in Philadelphia, where children are twice as likely to get asthma as the average American child. The refinery declared bankruptcy in January. The federal government has since granted it hundreds of millions of dollars in bailout money. But the heads of the company have been doing just fine. Former Energy Solutions CEO Phil Rinaldi and CFO James Rens claimed a combined total of around $11.6 million in summary compensation during 2014, according to Standard & Poor’s Capital IQ. Documents included with a public offering the firm later retracted show that Rinaldi held more than $18 million in outstanding equity awards at that fiscal year’s close. The workers’ union, the United Steel, Paper and Forestry, Rubber Manufacturing, Energy, Allied Industrial and Services Workers Union, Philadelphia Local 10-1, first lodged a complaint with the National Labor Relations Board (NLRB) in June of 2017. The NLRB is a federal agency whose job is protecting the rights of private-sector employees. The NLRB supplied The Partisan documents regarding the case in response to a Freedom of Information Act request. One such memo lists 700 workers on site as of June, 2017. This would signify a more than 50% cut in refinery staff over two years. Former CEO Rinaldi told the Senate the refinery employed 1,500 people in 2015. The federal government this February granted Energy Solutions hundreds of millions of dollars in bankruptcy bailout funds. The refinery filed for such protections a month before they would have had to pay up to comply with federal environmental law. The Renewable Fuel Standard encourages fuel producers to blend sustainable fuel like corn-based ethanol with their product. Those who blend more biofuel than the government requires can earn and, then, sell surplus credits. Fuel producers also have the option to ignore the biofuel blending obligations and simply buy the credits. Philadelphia Energy Solutions claimed they spent more than a billion dollars buying these credits before they declared bankruptcy. Energy Solutions’ parent firm Carlyle Group made an investment of $175 million in the refinery in 2012, Reuters’ analysis shows. The Group then stripped $594 million to repay shareholders before the bankruptcy. But rather than investment issues or a national decline in product demand, Energy Solutions blames the Renewable Fuel Standard as the central cause of their financial failure. The fossil fuel lobby has since taken the refinery as its mascot in a campaign to reform or destroy this environmental regulation. During a February conference call, CEO Dave Lamp of Texas-based refining firm CVR Energy spoke to investors of a “constructive political pressure” in the wake of the Philly refinery’s bankruptcy. The industry urges legislators to “allow free markets to work and, ideally, eliminate the mandate or, at a minimum, prevent RINs [biofuel credits] from picking winners and losers,” Lamp said. Meanwhile, as fossil fuel tycoons blame environmental rules for their own failures, their wealthy corporations are making money selling the same biofuels credits they claim to despise. Both senators and federal agencies allege that the EPA lacks the resources or acumen to adequately run the Renewable Fuel Standard program, which for this reason relies heavily on the Honor System. The EPA says they’ve prosecuted fraudulent biofuel credit transactions worth more than $500 million as of March, 2018. But poor data collection also makes sustained market manipulation hard to prove. Shortly before this article printed, Philadelphia Energy Solutions and RNG Solutions announced plans to build a facility at the Point Breeze site that will convert food waste to natural gas. City Council and the Mayor’s Office support the project because it will create jobs. Next Why Is Philly Offering Amazon Money We Don’t Have?